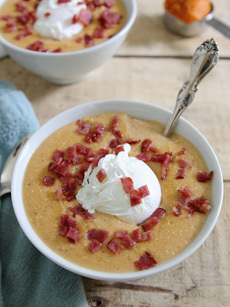  Fall food: pumpkin grits topped with a poached egg and bacon (photo courtesy Running To The Kitchen). What’s your favorite way to poach eggs? We like the evenness that comes from a poaching mold (photo courtesy Home Shopping | IE). A poacher for the stovetop (photo courtesy Cooks Standard). October marks the beginning of “pumpkin season,” and we’ve got everything from pumpkin milkshakes to pumpkin dinner rolls. This recipe, for pumpkin grits, was sent to us by Davidson’s Safest Choice Eggs—to whom it was sent by Gina of Running to the Kitchen. Prep time is 5 minutes, total time is 20 minutes. If you don’t have grits, substitute Cream Of Wheat or Cream Of Rice. Serve your pumpkin grits with an assortment of pumpkin swirl toast, pumpkin English muffins and pumpkin bagels. It’s not too much pumpkin: It’s a pumpkin celebration. 1. COMBINE the water, milk, salt, pumpkin, cinnamon, and nutmeg in a medium sauce pan. Whisk together and bring to a low boil. 2. ADD the grits and butter to the boiling mixture, reduce the heat to low, and whisk continuously for about 5-7 minutes, until thickened. While the grits cook, poach the eggs. 3. TRANSFER the grits to two serving bowls; top with bacon and poached eggs. Not everyone has good technique for poaching eggs the classic way: in a pan of simmering water with a spoon of white vinegar or lemon juice to help to keep the whites from spreading. Ours spread more than we’d like. 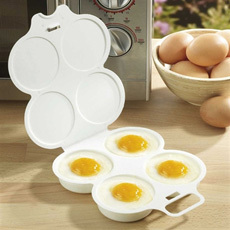 So purchased a pan specially fitted with poached egg inserts (photo #3). 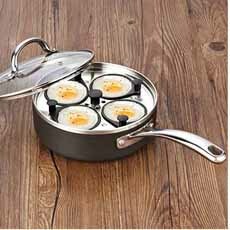 Works like a charm, although without the silky texture of water-poached eggs. We’ve also tried using a microwave poacher (photo #2) and an electric poacher, which creates boiled eggs rather than poached. Early on, we tried the individual silicone poaching cups, but found that they tip over too easily. What’s your favorite way to poach eggs?